Visit: http://www.puranikbuilders.com/real-estate-projects | Looking to buy Property in Thane and Pune. Puranik Builders Offers Residential Projects in Thane and Pune that define supreme class for your lifestyle. Residential Projects like Puraniks Sayama in Lonavala, Puraniks Aldea Espanola in Baner Pune, Puraniks City Reserva in Thane West, Puraniks Abitante in Bavdhan Pune, Puraniks Rumah Bali in Thane West, Puraniks Tokyo Bay in Thane West, etc. Visit: http://www.puranikbuilders.com/residential-apartments-in-thane-west-ghodbunder-road-for-sale/tokyo-bay | Puraniks Tokyo Bay a residential project developed by Puranik Builders. The project offers very well designed residential 1BHK and 2BHK Residential Apartments in Ghodbunder Road Thane West for Sale. Exclusive details of Puraniks Tokyo Bay in Thane West, Thane such as price, floor plan, construction status, project specifications and amenities. International Lifestyle: Aldea Espanola brings international standard homes to India with interiors and exteriors that transport you to a new world of luxury. Spanish Architecture: The sculpted archways, majestic staircases, pristine white walls and intricately detailed architecture here are right out of a Picasso masterpiece. Exotic Amenities: Whether it's the mosaic-bottomed pool, the scented gardens or the Modular Kitchen among others; the amenities at Aldea Espanola are meant to immerse you in the Spirit of Spain. Clubhouse: An evening of recreation awaits. The Clubhouse will give you countless reasons to fill your days with leisure. Location: Aldea Espanola is located in Baner, one of the fastest growing suburbs of Pune with a host of social infrastructure. Connectivity: Being in proximity to areas like Hinjewadi, Aundh and Deccan, through well-developed roads will take away the hassle of long, drawn-out commutes. Gated Community Living: Living in an expansive 17-acre gated community amidst charming cobbled pathways, lush gardens and wide-open spaces will open up your horizons to peaceful living. Restaurants and Cafés: You can enjoy your favourite Spanish delicacies at the restaurants at Aldea Espanola or sip your refreshing drink at the sun-soaked cafés. 'Pura Vida': These homes have been created for one simple purpose, ‘Pura Vida’ or the fullest enjoyment of life through the best of everything being made available to the residents. 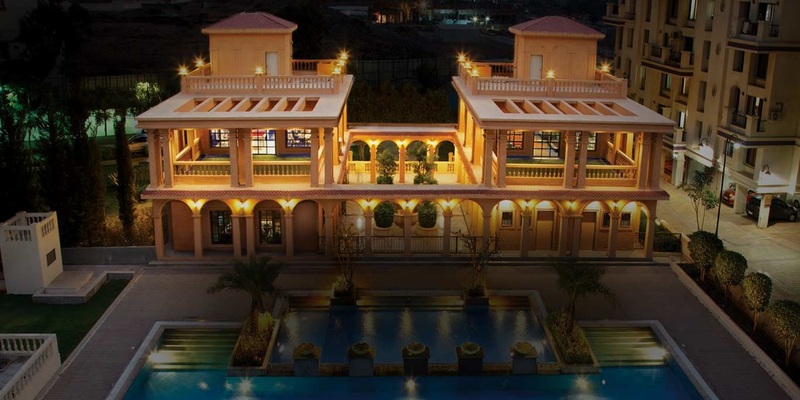 A home by Puraniks: Puranik Builders have established a reputation for bringing exotic living to India with various international standard, themed projects that have satisfied over 5001 families to date. So, Aldea Espanola is all set to fulfill and even exceed your expectations of international living with a Spanish Escape that is out of this world but situated in Baner! International living in India: Spanish Style! As individuals, we often crave to taste different parts of the world. This could be by watching movies, visiting exotic restaurants, meeting friends with travel experience or setting off on an adventure of our own. The mysterious and unknown lands, habits, cultures, architecture and people around the world can exhibit a strong pull over our senses. But it's difficult to always act on it. Say, you've just seen a movie about the colourful locales of Spain and you want to go there this very instant. It may not seem possible to you. But now, it is! You can live the international life at Aldea Espanola by Puranik Builders. Located in Baner, this gated community has incredibly plush Spanish-Style homes that will satiate your cravings for the alluring corners of Spain. This expansive community, with its archways, sculptures, grand staircases and wide open greens will immerse you in a world unlike you've experienced before. And you won't even need a plane ticket for this! What will further carry you closer to the Spirit of Spain? Well, the mosaic-bottomed pool will transport you under the Mojorca Sun. A stroll through the scented gardens too will be leisure at its best. Perhaps, you'll enjoy munching on some spicy Spanish delicacies at the restaurants or indulge in endless recreation at the Clubhouse? These are just some among the many Spanish-themed amenities at Aldea Espanola. Don't just keep dreaming of a world outside India but live in it, in the suburb of Baner! With Aldea Espanola, the grace, passion and elegance of Spain are within your reach. So what are you waiting for?